Also called as crane flower with the scientific name Stelitzia Reginae, this exotic flower is native of South Africa but grows almost every part of the world these days. Its name is derived from the fact that it has the shape of a bird in flight. Bird of paradise plant indoor features leaves that similarly look like a big feather or banana leaves with stalks that stretch about 18 inches in length. Each leaf is a foot wide and a little bit thick making it evitable to drop off on the floor or ground. On the other hand, the flower that blooms in orange sepals with a few blue petals, which closely appear like a bird’s beak, is the centrepiece of the entire plant. This isn’t the normal rounded or cupped flower. It’s definitely uniquely beautiful, and it appears a few times in a year. Most bird of paradise plants grow from 15 to 30 feet with huge leaves. However, you may find species that are smaller, which can be used for indoors. As mentioned earlier, bird of paradise plant indoor can grow in both tropical and cooler areas. You can have a couple of these plants in pots at most temperatures. There are limits, however, like tolerating up to 24 degrees Fahrenheit, but most likely survive temperatures between 65 to 70 degrees Fahrenheit. During winter, this foliage can prevent damages in flowers if kept indoor. Regardless, it’s a type of plant that is best grown in direct full sun, yet shaded parts are just alright. When planting, be sure to choose rich, fertile, loamy or a mix of sand and clay type of soil. Moreover, its growth process becomes more successful and quicker if you add some fertilizers, preferably compost. Fertilizing should be done quarterly or in other words every three months. Basically, this plant needs to be watered regularly to. Insufficient water can cause damage or slow growth. It is simple to grow bird of paradise plant indoor. Once you’ve chosen a good soil, dig a 3-inches deep hole and as wide as about twice or thrice the size of the root ball of the plant. Place the seed or cuttings in the hole and cover with soil. Gently pour water on the surface. Remove brown-yellow or dead leaves as well as fading flowers and damaged stalks of bird of paradise plant indoor. This helps continue the growth and increase quality of the plant to bloom more beautiful flowers. Aside from fertilizer, add mulch regularly. This is useful in conserving moisture, warding off weeds or pests and stabilizing the roots to remain firm and thick. For propagation, it is usually done by division. Remove old clumps of the bird of paradise plant indoor by digging them up and divide into four or five shoots. Typically, this must be accomplished between late spring and early weeks of summer. Transfer them in a separate pot with the same type of soil and make sure to add organic mulch and enough water. Planting new shoots or cuttings is clearly a much better option. This is due to the fact that it grows faster and produces flowers in a shorter period of time. 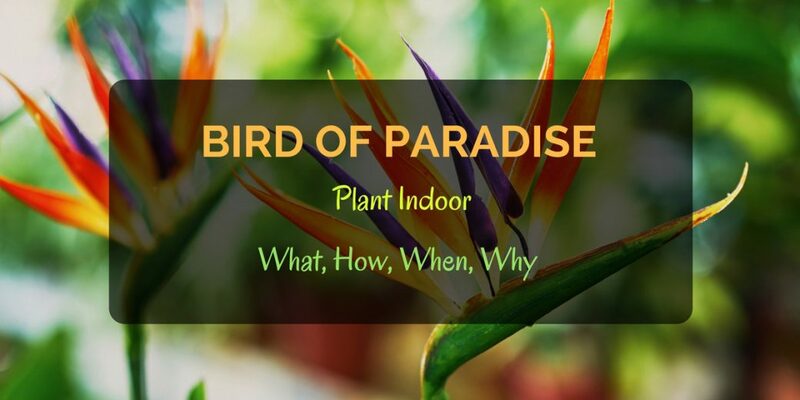 Despite its easy care and maintenance, bird of paradise plant indoor can have problems. Like most plants, beware of pests, weeds and diseases. You may also need to get rid of caterpillars, snails and aphids by spraying them with organic or natural herbicides.